Special: Vitrociset never-ending Story ? The autonomous vehicle is designed to carry supplies into hostile environments – and evacuate injured soldiers from the battlefield. In this first test, the vehicle hovered 10 feet off the ground for a couple of minutes, but it is capable of flying at much higher altitudes while carrying payloads of more than 4000 pounds. After landing, the UAV folds up its propellers and transforms into a supply truck, capable of navigating over rough terrain. Advanced Tactics Inc. announced that it has received government approval for and has released the Black Knight Transformer first driving and flying test video. Advanced Tactics is at the forefront of large scale multicopter design, production, and testing and the successful flights of the Black Knight Transformer open the door to a number of future aircraft designs that leverage Advanced Tactics’ patented and patent-pending technologies. 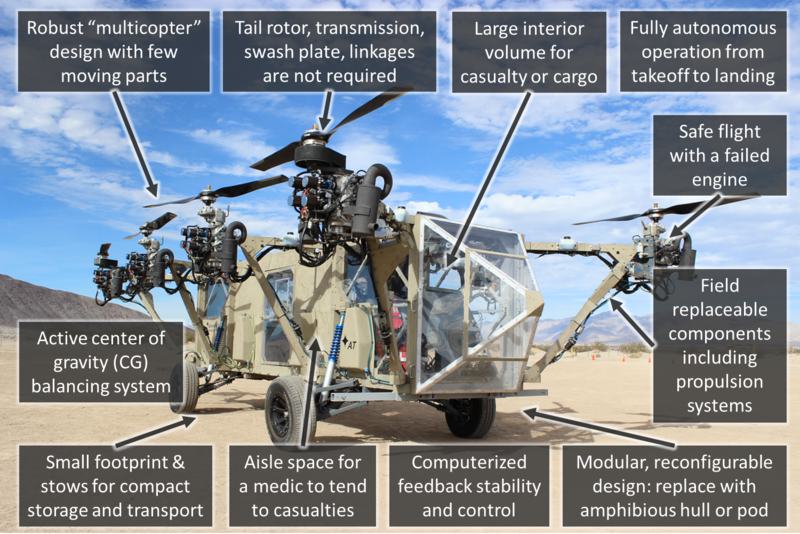 The patented AT Transformer technology combines the capabilities of a helicopter, such as the ability to take off and land anywhere, with a modular payload system. The ground drivetrain can be detached from the flight system and replaced with an amphibious boat hull, cargo pod, or ISR pod. Snapshot from aerial footage of the aircraft in hover filmed by a quadcopter drone. The quadcopter weighed approximately one thousandth of the weight of the Black Knight Transformer. The flight test was performed at a private location in Southern California and a remote backup pilot was present for safety. The stability and attitude of the aircraft was controlled entirely by the autopilot. The only commands from the remote backup pilot were to increase or decrease overall power. Outrigger landing gear was attached to the aircraft to prevent it from rolling over in case of any mishaps during testing. The aircraft completed multiple short hover flights. Although the aircraft is capable of hovering at thousands of feet above the ground, the altitude was limited to less than 10 feet above the ground for safety. The aircraft was stable, controllable, and performed as expected. The advantages and features of the AT Black Knight Transformer. The AT Transformer technology is scalable and reconfigurable with modular payloads. Advanced Tactics is also currently developing an autonomous modular version of the AT Transformer capable of delivering up to 3,500 lb payloads in a detachable cargo pod at up to 200 kt TAS and capable of hovering for over 19 hours with a 150 lb ISR payload. Its small footprint makes it ideal for shipboard applications and tight landing zones. The AT Transformer technology can be interfaced with easy-to-use autonomous flight systems that provide obstacle avoidance and decision making capabilities such as landing site selection. The aircraft provides a suitable platform for the recently demonstrated U.S. Office of Naval Research’s Autonomous Aerial Cargo/Utility System (AACUS) program and is already part of the U.S. Marine Corps Warfighting Laboratory’s Enhanced MAGTF Operations Aerial Delivery (EMO AD) program. The Black Knight Transformer was proposed in 2010 to the DARPA Transformer (TX) program (renamed to DARPA ARES), but was not selected for the program. That program was originally intended to develop a flying truck but in 2012 the goals were refocused on cargo pod delivery. 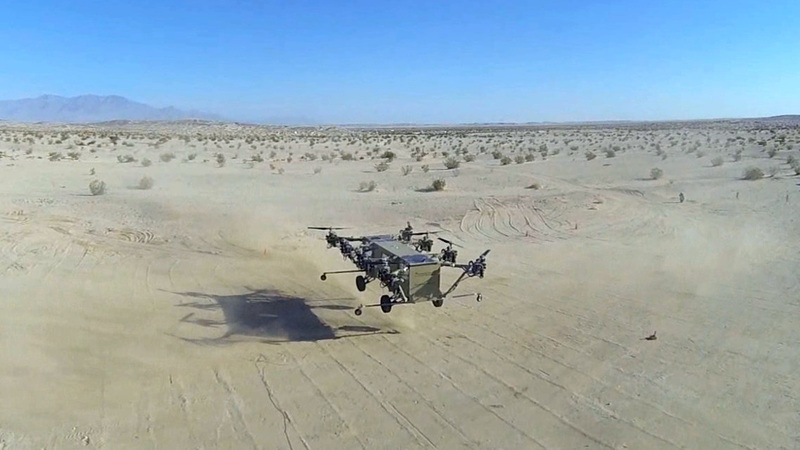 The Black Knight Transformer technology demonstrator has been developed with less than $2M in U.S. government funding and within the original DARPA TX timeline including the first flight in 2014. The AT Transformer technology can achieve and exceed all of the original and new goals of the program and can provide an affordable and better performing alternative to the aircraft being developed for DARPA ARES.